Dimensions: 11" x 8 1/2"
Here is another in the popular series of books from Schiffer Publishing documenting fashion trends in America. 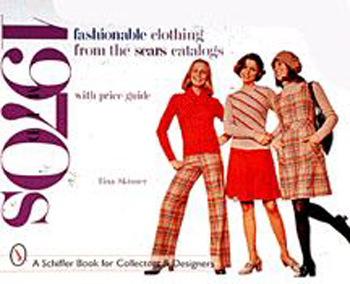 Fashionable Clothing from the Sears Catalog, Mid-1970s, illustrates a host of memorable styles from the transitional mid-'70s, ranging from bold colors, platform shoes, and flare-leg pants to leisure suits, traditional plaids, and tweed-textured fibers. It is an invaluable resource for fashion designers looking to revive and rework retro styles, for costume designers working to recreate an era, and for collectors trying to document vintage clothing. A visual treasure chest, this book offers almost 400 full-color photographs, with well over a thousand items of clothing, shoes, and accessories pictured, along with detailed descriptions. In addition, the book offers approximate retail values for these items on today's market.